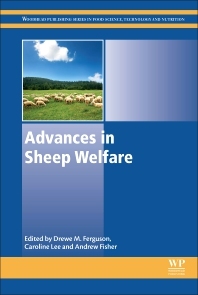 Advances in Sheep Welfare examines the recent advances made in sheep welfare assessment, handling and management, providing state-of-the-art coverage of the welfare needs of one of the world’s most widely farmed animals. Drewe Ferguson leads the Livestock Systems Program within CSIRO Agriculture and Food. He is recognized for his research in advancing livestock welfare through improvements in livestock resilience and management and husbandry practices. Caroline Lee leads the animal behavior and welfare team at CSIRO, Australia. Her research interests include developing novel methods to assess affective states, assessing cognition and learning and improving welfare assessment of farm animals. Andrew Fisher is Chair of Cattle and Sheep Production Medicine and Director of the Animal Welfare Science Centre at the University of Melbourne, Australia. He has significant experience in animal welfare research, with a particular focus on production animal management, transport and pain management. He is also actively involved in the translation of animal welfare research into public and organisational policy.